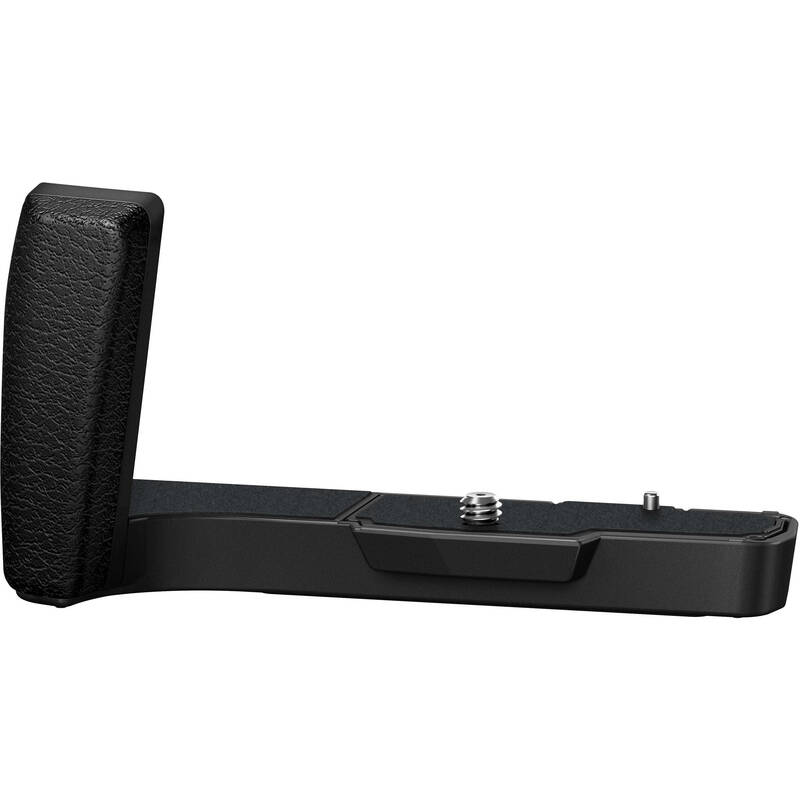 Offering a larger, easier to hold grip for your Olympus OM-D E-M10 Mark II mirrorless camera, the ECG-3 External Metal Grip is a simple accessory to improve your handling while shooting. The leatherette finish matches the E-M10 Mark II body design, an integrated release lever permits quick access to the battery and memory card compartment, and the grip attaches to the camera via the tripod mount. Box Dimensions (LxWxH) 5.433 x 3.307 x 3.228"
ECG-3 External Metal Grip is rated 4.5 out of 5 by 23. Rated 5 out of 5 by Richard from Great addition to the camera It adds very little weight to the camera; however, it is so necessary to create a better grip for the camera. A small lever allows removal of the major part of the grip so that a memory card or battery can be changed. Easy to take off the entire grip if so desired. The camera size is not increased that much so it will still easily fit into a very small bag like the Mirrorless Mover bag from Think Tank. I just wish Olympus had planned for this grip to fit both the EM10 and the OM10ii but no such luck. So if you are upgrading like I did and still want to use the add-on grip you will have to purchase this new model. Rated 5 out of 5 by Luc C. from Great product..... well-built and well designed This is a great product for the Olympus OM-D E-M10 Mark II. It fits nice and tight, and adds very little weight or size to the camera while providing a much better handling when shooting. The grip is well-built and doesn't require a separate tool or wrench to attach it to the base of the camera: there's a built-in wheel that controls the tightening of the screw. Also, the bottom plate can be removed (without having to unscrew the grip) by flipping a switch if you need to change the battery or the SD card. I like this one even better than the ECG-4 grip for the Pen-F which is also a very good grip. Rated 4 out of 5 by Stephen C. from Nice accesory PRO: Perfect fit on the camera and certainly does it's job of providing a more substantial grip. I've used the camera for almost a year without one, mostly with a large 14-150 mm lens attached. I was totally used to just gripping the camera body very tightly. The new grip does make the camera nicer to hold and it is possible that a percentage of my hand-held shots are steadier than before. I would not consider an after-market grip vs. this Olympus product. It locks on very securely and, except for the base, can be easily snapped on and off to replace the battery and memory card. Quality fit and finish. Cons: Makes the camera a little bigger. It attaches to the bottom of the camera and makes it nearly a 1/2 in taller. This might might not be so bad since I can now get my little finger involved in holding the camera with my slightly smaller than average adult male hands. If you use a tripod plate, the plate must be removed before you can snap the grip off to replace the battery or card. Conclusion: I like it and it will stay on my camera constantly unless I'm using a tripod exclusively. Rated 4 out of 5 by Jordan S from Nice grip, but not perfect I bought the ECG-3 for the times I wanted a bit more purchase for my hands than the E-M10 II offers natively, and for that it works fairly well. The grip is comfortable and provides a nice resting place for your pinky as well. The quick removal system where a switch allows most of the grip to be rapidly removed to access the battery compartment is both a great idea and the source of my only issue with the grip. The detaching and attaching of the grip works well, but because the grip is attached via a clip on method, it's not as rigid as a single piece grip would be, and as such, it can wobble a little if pulled or tilted forward from the camera. It's minor, but it can be felt when using the camera and easily seen if you move it intentionally. I'd honestly prefer to lose the quick release and have a more solid grip. Rated 5 out of 5 by richard from Great Addition Makes handling with bigger lenses much easier. Good design. Able to access battery and SD card with grip attached. Rated 4 out of 5 by Anonymous from works well Obviously adds a little weight and size to the overall camera but worth it to have a better grip. Goes on easily and the smaller screw on part stays in place while the bigger part easily snaps off and on again to change out the battery or SD card. Rated 5 out of 5 by Mistag from Perfect fit! If you have large hands, this is a great addition to your camera. Very easy to install and the quick release allows you to easily access your battery and memory card. I would recommend this product. Rated 4 out of 5 by Walter P. from nice for hand-holding; poor for using a tripod quick-release This grip fits perfectly (being made by Olympus for one of its own cameras, it should). It provides a better grip for most lenses. It helps when a heavy lens is attached - the 100-400mm Elmar for example - but it's marginal when used for such an optic. Removing half the base to replace the battery or memory card is pretty quick an easy. The major flaw: it has it's own 1/4 X 20 socket for attaching to a traditional tripod screw, but that socket is so positioned that if you want to attach an Arca-Swiss style plate, you must first remove that plate before you can remove the grip to replace a battery or memory card. That's a poor design. An Arca-Swiss size dovetail should have been molded into the grip. If you're going to hand-hold the camera most of the time, and are willing to use a traditional screw for the rare times you use a tripod, this is a great little grip. If you want to use an Arca-Swiss or other quick release system, this grip is not good. can the camera be attached to a tripod while the grip is on? will the ecg-3 grip work on the e-m10m mark III?